Noctis character downloadable content information incoming. 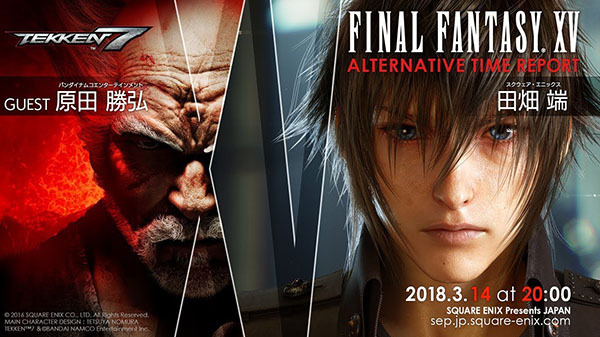 Square Enix will host a “Final Fantasy XV Alternative Time Report Tekken 7 Collaboration Special” broadcast on March 14 at 20:00 JST, the company announced. You will be able to watch it live on YouTube and Niconico. The broadcast, which will commemorate this week’s release of Final Fantasy XV Royal Edition and Final Fantasy XV Windows Edition, will feature Tekken series chief producer Katsuhiro Harada as a special guest in addition to Final Fantasy XV director Hajime Tabata. In addition to overviews the Royal Edition and Windows Edition, there will also be new information on the upcoming Noctis character downloadable content for Tekken 7. Both Final Fantasy XV and Tekken 7 are available now for PlayStation 4, Xbox One, and PC.